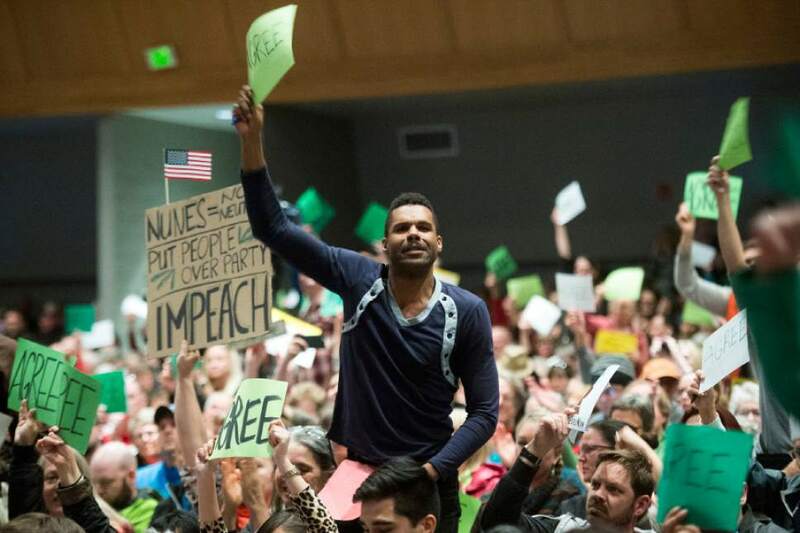 Utahns' loud boos drown congressman's replies to questions on Trump, Russia, health overhaul and Mexican border wall. 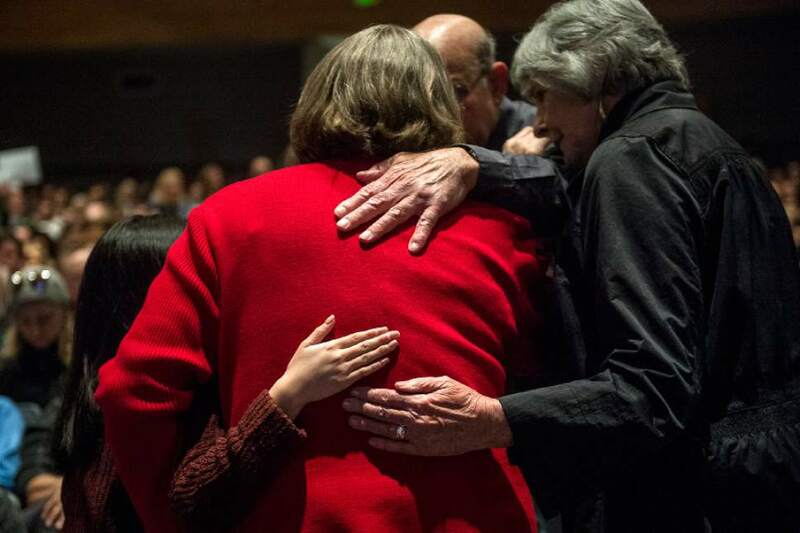 Chris Detrick | The Salt Lake Tribune Pat Winmill, of Salt Lake City, is hugged by other members of the audience after attempting to clarify her earlier question about the environment to Rep. Chris Stewart during a town hall meeting at West High School Friday March 31, 2017. 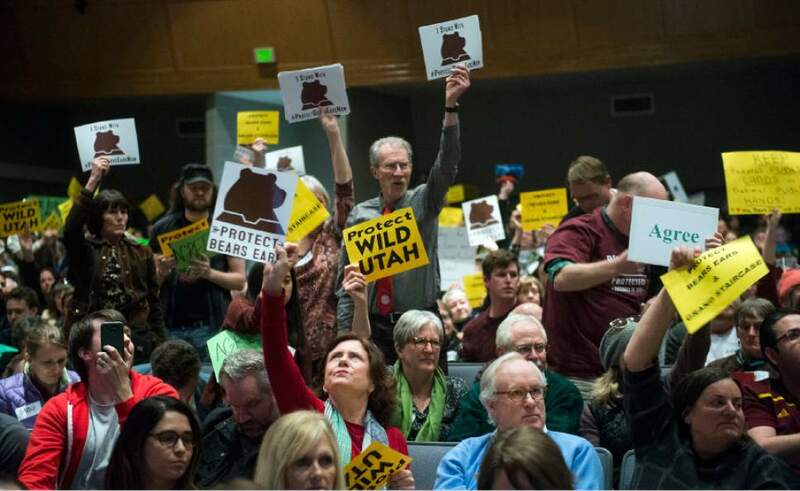 Chris Detrick | The Salt Lake Tribune Pat Winmill, of Salt Lake City, asks an environmental question to Rep. Chris Stewart during a town hall meeting at West High School Friday March 31, 2017. 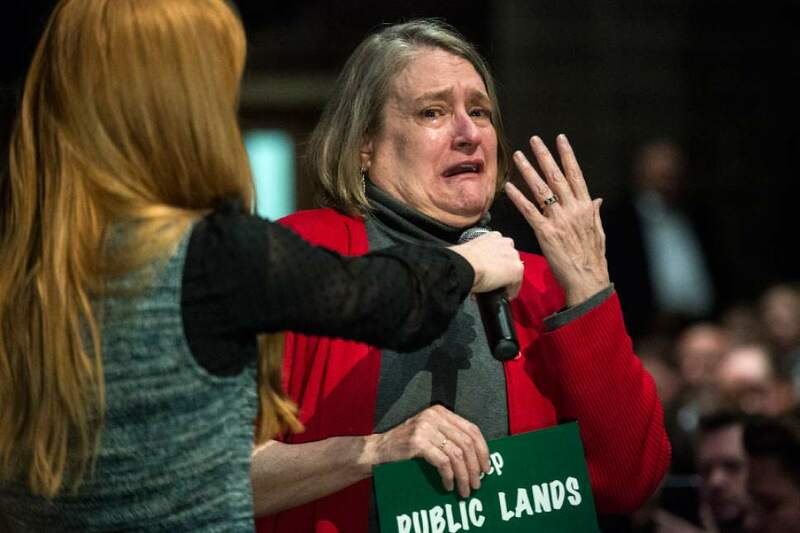 Chris Detrick | The Salt Lake Tribune Pat Winmill, of Salt Lake City, cries while attempting to clarify her earlier question about the environment to Rep. Chris Stewart during a town hall meeting at West High School Friday March 31, 2017. 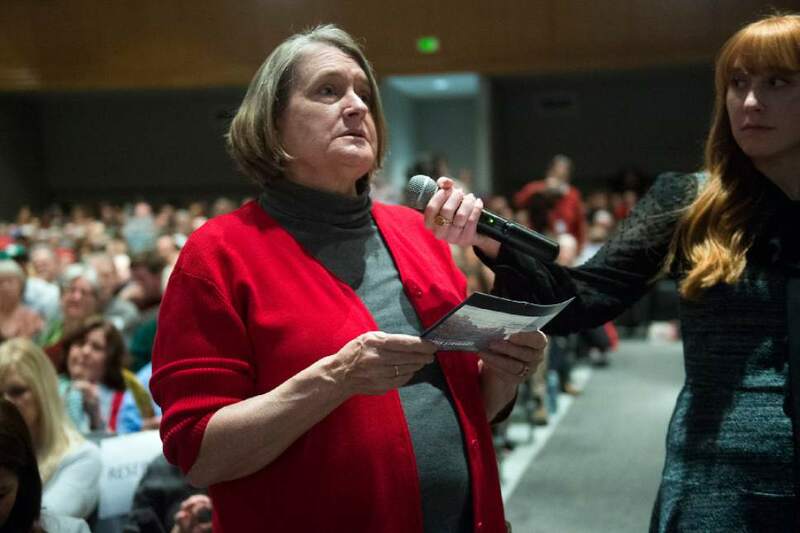 Chris Detrick | The Salt Lake Tribune Utah Indivisible founder Courtney Marden asks a question to Rep. Chris Stewart during a town hall meeting at West High School Friday March 31, 2017. Chris Detrick | The Salt Lake Tribune Luis Garza, of Salt Lake City, asks a question to Rep. Chris Stewart during a town hall meeting at West High School Friday March 31, 2017. 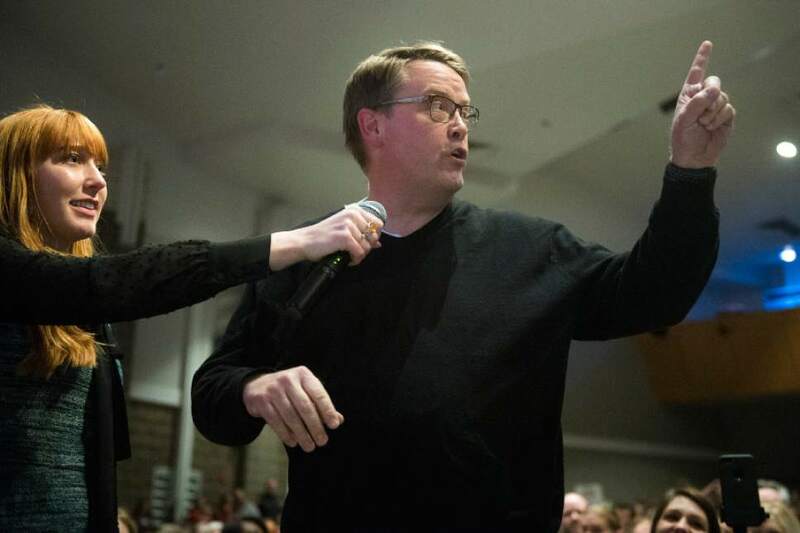 Chris Detrick | The Salt Lake Tribune Mike Keil, of Stansbury Park, asks a question to Rep. Chris Stewart during a town hall meeting at West High School Friday March 31, 2017. 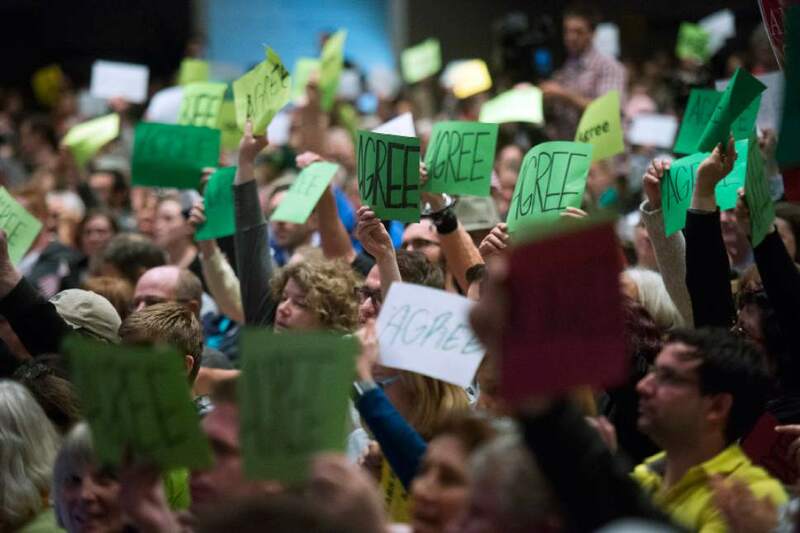 Chris Detrick | The Salt Lake Tribune Members of the audience hold up signs at Rep. Chris Stewart during a town hall meeting at West High School Friday March 31, 2017. 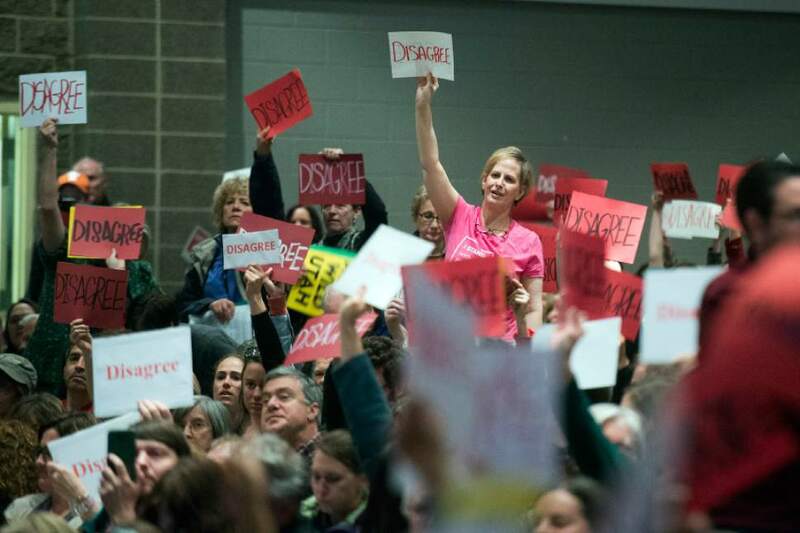 Chris Detrick | The Salt Lake Tribune Members of the audience hold up signs at Rep. Chris Stewart during a town hall meeting at West High School Friday March 31, 2017. 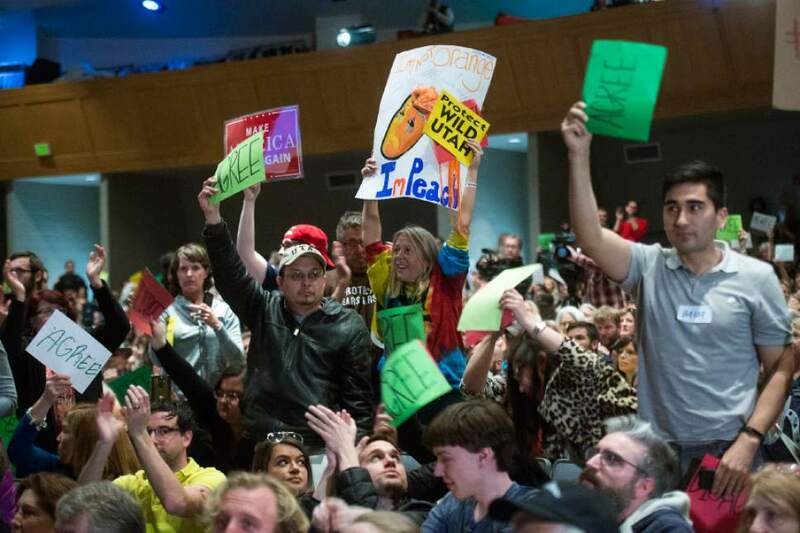 Chris Detrick | The Salt Lake Tribune Members of the audience hold up signs at Rep. Chris Stewart during a town hall meeting at West High School Friday March 31, 2017. Chris Detrick | The Salt Lake Tribune Members of the audience hold up signs at Rep. Chris Stewart during a town hall meeting at West High School Friday March 31, 2017. Chris Detrick | The Salt Lake Tribune Members of the audience hold up signs at Rep. Chris Stewart during a town hall meeting at West High School Friday March 31, 2017. 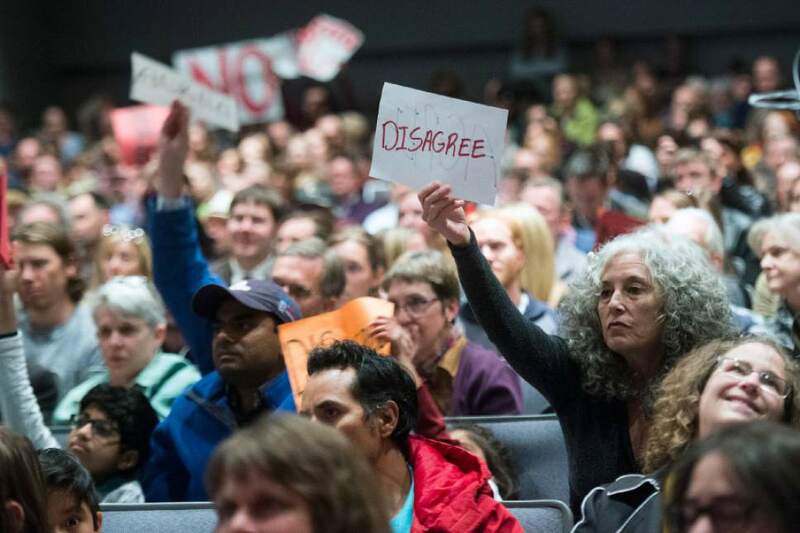 Chris Detrick | The Salt Lake Tribune Members of the audience hold up signs at Rep. Chris Stewart during a town hall meeting at West High School Friday March 31, 2017. Chris Detrick | The Salt Lake Tribune Members of the audience hold up signs at Rep. Chris Stewart during a town hall meeting at West High School Friday March 31, 2017. 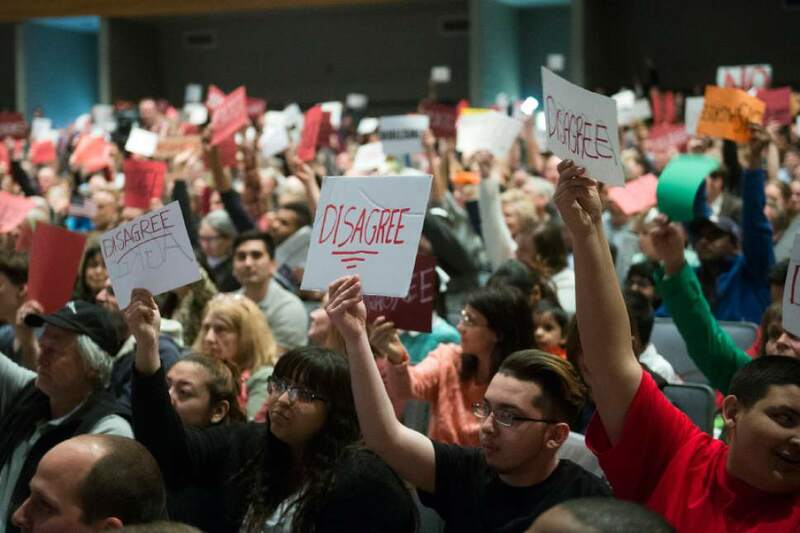 Chris Detrick | The Salt Lake Tribune Members of the audience hold up signs while yelling and cheering at Rep. Chris Stewart during a town hall meeting at West High School Friday March 31, 2017. Chris Detrick | The Salt Lake Tribune Members of the audience hold up signs at Rep. Chris Stewart during a town hall meeting at West High School Friday March 31, 2017. Rep. Chris Stewart stood on stage for 56 minutes and stared out at an audience of 1,000 unfriendly faces. "Do your job," they shouted. "Who are you in bed with?" they jeered. The crowd continued in its clamor as Stewart tried to answer questions during his town hall Friday at Salt Lake City&apos;s West High School. Many of the Republican congressman&apos;s replies went unheard. Most attendees seemed not to care what he had to say anyway. "If you want me to answer it, in fairness you have to make it so I can do that," Stewart pleaded at one point. They booed as he finished the sentence and continued during his responses to each topic brought up: public lands, immigration, health care, President Donald Trump and a wall between the United States and Mexico. The congressman  whose sprawling 2nd Congressional District includes Salt Lake City and stretches from southern Davis County to St. George  addressed 11 questions. His staff randomly drew out of a large plastic tub white slips of paper with the names of constituents who wanted to speak. Each person walked to a microphone at the front of the room and railed at Stewart. Just one man used his time to thank the representative. The attendees drowned out Stewart the most, though, while he addressed two questions on Russia and the Trump administration  topics he weighs in on as a member of the House Intelligence Committee. "Can you name one thing you&apos;ve done in the [past] 60 to 80 days to hold this administration accountable?" one man asked. "You and I are not going to see the world the same," Stewart responded before the crowd shouted over him. He stood at the podium and continued to talk. The speakers carried pieces of his speech over the noise, with fragmented notes about classified information and continuing to investigate alleged wrongdoings by the president. "We&apos;ll pursue this and see where we end up," he finished. He had a nearly identical answer for probing supposed collusion between Russia and Trump&apos;s team to sway the 2016 election, suggesting that there is "no evidence" that the president or his staff were involved in a case of foreign meddling. "What about Michael Flynn?" the audience yelled. "We&apos;ll continue to investigate," Stewart said. "You can&apos;t have something like this happen and not realize that it will eventually come out." Stewart has been quiet about recent revelations that Intelligence Committee Chairman Rep. Devin Nunes received reports from White House officials that showed Donald Trump&apos;s campaign was incidentally swept up in the surveillance of foreign nationals by U.S. spy agencies. Nunes talked about the findings with the president, leading many to accuse the congressman of eagerly doing the bidding of the administration rather than conducting an independent congressional review. Utah&apos;s Rep. Jason Chaffetz has defended Nunes, calling him a man of "high integrity." One man in the audience, though, held a sign that said "Nunes ≠ neutral." Ann Johnson, of Bountiful, gripped a poster that said "Repeal and replace Congress." "Nunes seems to be carrying information to the White House when that&apos;s who he&apos;s supposed to be investigating," the 75-year-old Republican said. 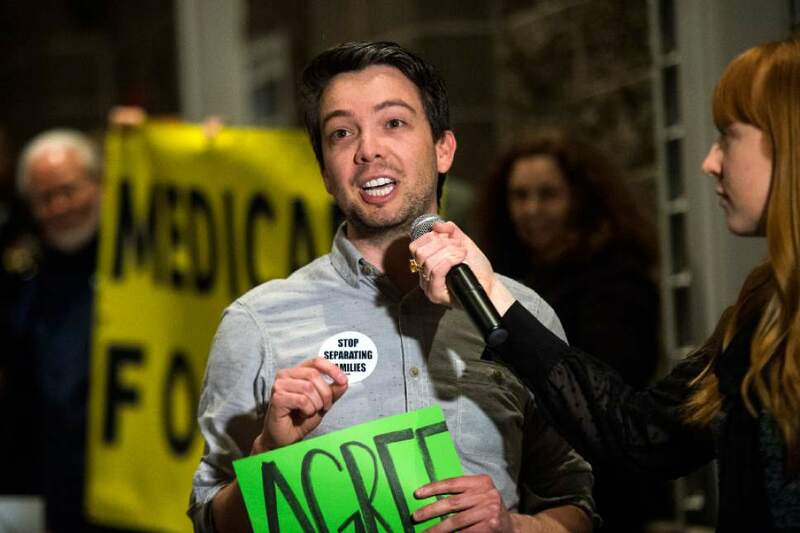 Friday&apos;s town hall was the first to be held in person by a member of Utah&apos;s all-Republican congressional delegation since Chaffetz&apos;s rowdy February event in which 1,000 people were allowed inside. Another 1,500 stood outside  barred from entering because of fire codes. Those who didn&apos;t make it into the auditorium rallied and chanted while those inside shouted over Chaffetz, urging him to "explain yourself." After that, Utah Republican Party Chairman James Evans said the event was "violent" and unsafe; he warned representatives to skip in-person forums  an assessment not shared by police, nor by Chaffetz. Evans attended Stewart&apos;s town hall Friday and said it, too, was hostile and harassing. "I think it was more disrespectful than anything," he said. Unlike Chaffetz&apos;s event, though, no one was kept out of Stewart&apos;s. About 200 people were temporarily held outside as the minutes ticked down to the 7 p.m. start time. The congressman walked out and said, "I&apos;m sorry. We&apos;re trying to get everyone in." And by five minutes into the event, those remaining behind the doors squeezed into the auditorium. Police turned away 12 people who showed up more than 45 minutes after the event started. People had arrived for the town hall as early as 3 p.m.
Sen. Jim Dabakis stood at the front of the line, handing out fake Russian currency, telling people they were "now paid operatives"  riffing on a comment Chaffetz made and later walked back that the attendees at his town hall were paid protesters. More than half of the audience was made up of members of the state&apos;s growing "resistance" movements. Stewart gave the first question to Courtney Marden, founder of Utah Indivisible. "How could you have supported a bill that takes health care away from so many people that voted for you in good faith?" she asked. "We&apos;re trying to make it better for you," Stewart said as boos erupted. "You guys should be happy, then  you have Obamacare." Stewart, Utah&apos;s lone unequivocal supporter of the GOP bill to replace Obamacare, was discouraged when the measure was pulled last week. 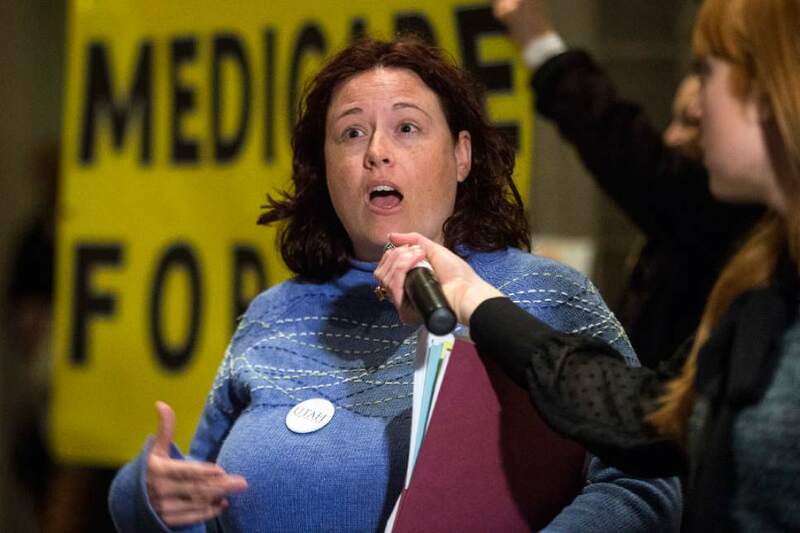 He had postponed his town hall  slated for March 24  to vote "yes" on the bill to shift control of Medicaid back to the states and remove the tax fine for not having insurance. An estimated 24 million fewer people were to have health coverage under the plan, though Stewart said Friday that that number represents "those who chose" not have insurance. Marden, a nurse, commended the congressman for "the bravery" of standing onstage and facing the criticism head on. "We&apos;re trying to be as civil as possible," she said. Utah Indivisible compiled questions to ask the congressman and printed information packets on his voting record. "Stewart flies under the radar," Marden added. "That&apos;s what he does." Three of the questions asked during the event focused on Bears Ears National Monument and federal lands, which Stewart says he wants more state control of. "I think there&apos;s this assumption that if you&apos;re Republican you hate the environment," he said. "I have to tell you I think that&apos;s a silly place to start an argument." As Stewart ended the town hall and slipped behind the stage&apos;s red curtains, the crowd roared in anger. The only time it cheered at the congressman is when he said, "It&apos;s my job to be here."